Superman was originally conceived as a bald villain with the power to control people's minds. Many people believe the role of Superman is cursed, and bad luck will befall any actor who plays the character. 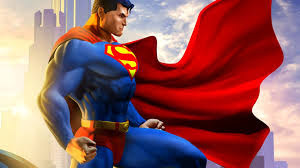 Superman was created by American writer Jerry Siegel and Canadian-born American artist Joe Shuster. Earth Name: Clark Joseph Kent. Kal-El was born in Kripton. Biological parents: Lara and Jor-El. Adoptive parents: Martha and Jonathan Kent. Clark Kent is married to Lois Lane. His height is 6' 3" (1.90 m). Superman's first Appearance: ACTION COMICS #1 (June 1938). The known S-shield is actually a Kryptonian symbol meaning “hope”. Superman's nicknames: "The Man of Steel", "The Man of Tomorrow", and "The Last Son of Krypton"
Some of his best known enemies: Lex Luthor, Brainiac, Bizarro, Darkseid, Cyborg Superman, Metallo, and Doomsday. Known powers: x-ray vision, super breath, flight, super speed, heat vision, invulnerability and super strong. Kryptonite is one of the few things that can injure or kill Superman. In modern speech, the word kryptonite has become a synonym for Achilles' heel, the one weakness of an otherwise invulnerable hero. Superman's alter ego, Clark Kent hasn't always worked for the Daily Planet newpaper. He orginally worked for the Daily Star. Superman can be seen somewhere in every episode of the television show, Seinfeld. Empire magazine named Superman the greatest comic book character of all time. A street in Fullerton, California, shares its name with Superman's girlfriend - Lois Lane. Superman once travelled back in time and met the famous English playwright, William Shakespeare. The Metropolis skyline was orignally based on the Canadian city of Toronto. The actor, Nicolas Cage, named his son Kal-el, which is Superman's birth name. In 2004, British cinemagoers voted Superman as the greatest superhero of all time. Famous Superman fans, Jon Bon Jovi and Shaquille O' Neal, both have tattoos of Superman's famous 'S' symbol. Superman's dog is called Krypto. When he's not fighting crime, Krypto has his own secret identity. He goes by the name of Skip.